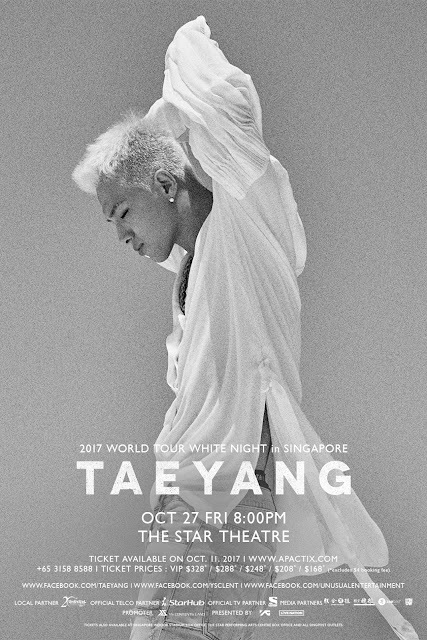 GOKPOP | Exclusive K-News in Malaysia & Singapore: TAEYANG 2017 World Tour "White Night" in Singapore - Public Sale starts from 11 October! 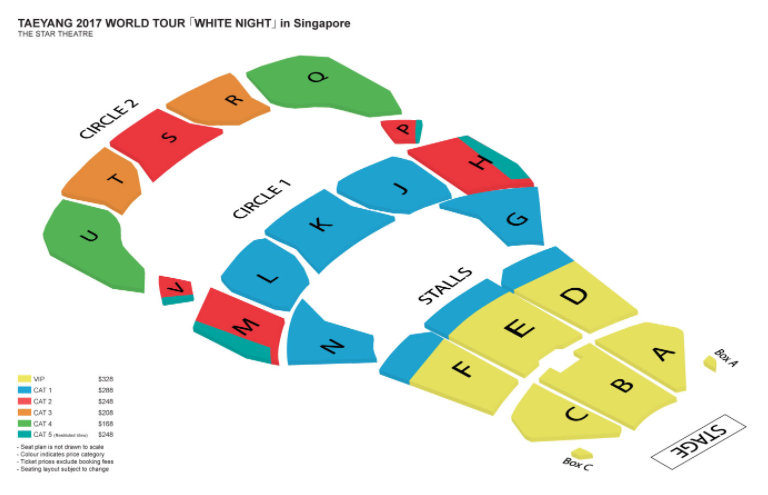 TAEYANG 2017 World Tour "White Night" in Singapore - Public Sale starts from 11 October! TAEYANG 2017 World Tour <WHITE NIGHT> to be held in Singapore on 27 October 2017, 8pm at The Star Theatre. TAEYANG, the lead singer of Big Bang is best known for his soulful voice. In 2008, TAEYANG broke out as a solo artist with the EP “Hot”, which won Best R&B & Soul Album at the 6th Korean Music Awards. TAEYANG has been successfully building his career as a solo artist. TAEYANG concert world tour commenced with a total of six shows in Chiba & Hyogo, Japan and Seoul in this July. Followed by North America from late-August to with mid-September. TAEYANG will then tour to Asia include Manila, Hong Kong, Bangkok, Jakarta, Kuala Lumpur, Macao; and then, TAEYANG will be heading to Singapore to stage his concert tour on 27 October, 8pm at The Star Theatre and will end the tour on 29 Oct in Taipei. TAEYANG is ready to perform more hit tracks for everyone. The beauty of it is expressed on stage where TAEYANG shows his passion and sincerity as an artist savouring music, so don’t miss TAEYANG’s passionate performance on 27 Oct 2017, 8pm at The Star Theatre. Public sale will commence on 11 October 2017 and will be available for purchase through all APACtix channels from 10am onwards. To book, log on to www.apactix.com or call +65 3158 8588. Tickets are also available at Singapore Indoor Stadium Box Office, The Star Performing Arts Centre Box Office and all SingPost outlets. All VIP ticket holders are entitled to attend the sound check session that will be held in the afternoon on the concert day and an exclusive laminated pass. This concert tour in Singapore is brought to you by UnUsUal Entertainment.